You would not find snack recipes as simple and as easy as this very exotic looking cranberry walnut baked brie preparation! At first glance you would like to serve this cheese recipe with a glass of chilled bubbly or wine. In fact, this recipe will be a refreshing change to the regular cheese slices and cubes served with wines. Just a generous drizzle of golden nectar or honey, a few toasted nuts and dried fruits, and voila… you have an instant exotic cocktail appetizer right before you! You may also prepare a bigger portion of this preparation and enjoy left overs for breakfast with a nice toast of multi grain bread slice and a generous serving of a hot or cold beverage of your choice. 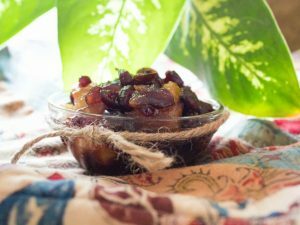 Anyhow, you will love this easy peasy warm and gooey cheesy preparation with delicious fruit and nut combination over some plain and crunchy cracker bite! Preheat oven to 180 degrees C. Place a section or wedge of brie cheese over an oven grill rack in the middle of the oven or on a lined baking tray and bake in the oven for about 5 minutes or less, until the cheese becomes a little soft in the center. Remove the cheese from oven and let the brie slice cool a little. Transfer the cheese slab to the serving platter and set aside in a warm place so the brie does not get cold and stays warm. In an oven safe bowl, add the walnuts, cranberries, and salt. Stir it all lightly and then bake it in the oven for 3 to 4 minutes at 220 degrees C until the nuts are fragrant and toasted in appearance. Drizzle the honey over brie wedge and top the toasted fruit and nut over honey. You may also go vice versa by placing the toasted dried fruit and nut mixture on cheese wedge first and then drizzle the honey over the nut and dried fruit mix. 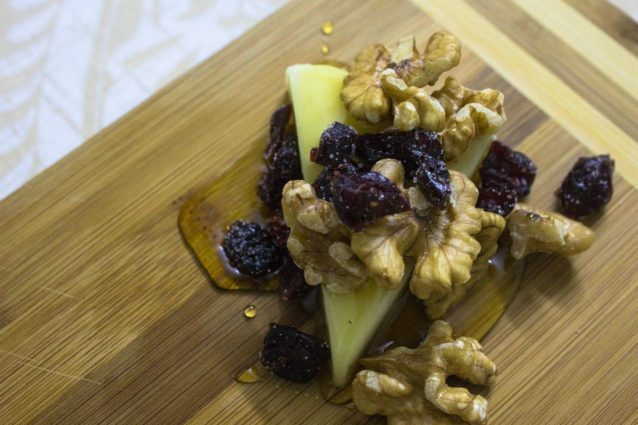 Serve the cranberry walnut baked brie with a few crackers and enjoy! Instead of toasting the walnut and cranberries in the oven you may alternatively microwave the ingredients in a microwave safe dish for 2 minutes. Serve the cranberry walnut baked brie with a generous serving of plain crackers or salted crackers. 4 No bake cookies recipe: just two ingredients to make these easy and tasty breakfast cookies!